For more information on art shows and poetry readings at CORE Winery in Orcutt, visit corewine.com. It's late afternoon on Saturday, June 30, and the CORE Winery in Old Town Orcutt is packed. LIKE FINE WINE Artists taking part in VTC Enterprises' new art program are featured in an exhibit at CORE Winery. On weekend nights, the cozy little tasting room can get busy, but today it's jam-packed with so many people I can barely make my way around. That's because the attendees that make up the standing-room-only crowd aren't just there to sip a glass of pinot and listen to the old records that spin on the retro turntable behind the bar. Today, CORE is hosting an art show with works by some unknown but very talented artists. 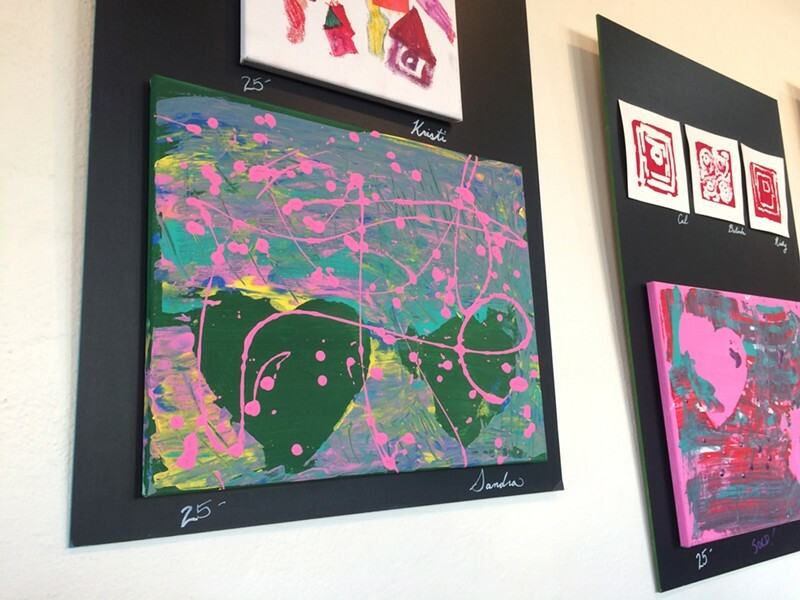 The show features paintings and sculptures created by adults with disabilities participating in an art program though VTC Enterprises, a nonprofit that provides vocational training in the community. The show is being hosted by the Ian M. Hassett Foundation, another nonprofit, and includes the work of several artists in the program. The work is amazing: nearly every foot of blank space on the walls is covered with brightly colored paintings, many of them abstract and eye-catching. One of my favorites features the silhouettes of two squirrels set against Jackson Pollock-like splashes of green, blue, and yellow. In another, balloon-like orbs of primary colors stand out from the center of a white canvas. Many of the artists themselves are here and watch as the attendees buy their paintings with gusto. In the short time I spend at the show, I see someone proudly scrawl the word "sold" in big-bold letters next to five or six of the paintings. At least one of them was one I'd considered buying, and I mentally kick myself for not rushing to claim it sooner. Every time I go to an art show, I always end up chiding myself for not going to more of them. It seems like an indulgence in a fast-paced society where we spend most of our time constantly rushing around from one task to the next at a breakneck speed. I almost feel a little guilty about stepping out of that manic slipstream and shuffling quietly down the halls of a gallery or museum, quietly taking in the images. But art has value, and I don't just mean that in a monetary sense. Viewing it can be a meditative, even therapeutic, experience. Creative expression, especially visual creative expression, allows people to bridge gulfs in language, age, gender, culture, and other societal chasms. Staff Writer Chris McGuinness will buy that painting, please. He can be reached at cmcguinness@newtimesslo.com.